Taste test: These are good narrow-rippled barbecue chips with an average crunch, a tangy, spicy taste and a fairly hot, lingering aftertaste. The taste is pretty good, and the aftertaste really does linger for a while  it goes away for a second if you drink a beverage, but then it immediately returns. This bag cost just 50 cents and contained a generous number of fairly large, unbroken chips. I liked Terrell's Dinosaur Barbecue chips better than these, as these taste more like barbecue powder, and those tasted more like barbecue sauce, but these are still pretty good chips, with a good kick of heat. Smell test: Very mild barbecue smell. 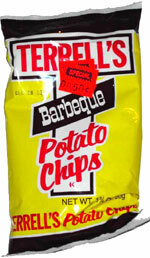 Company: Terrell's Potato Chip Co., Inc. 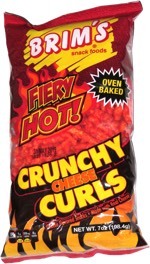 This snack was discovered by Keith and Melissa in Syracuse. Review published .